Never has it been more dangerous for people in search of protection to make the crossing to Europe. 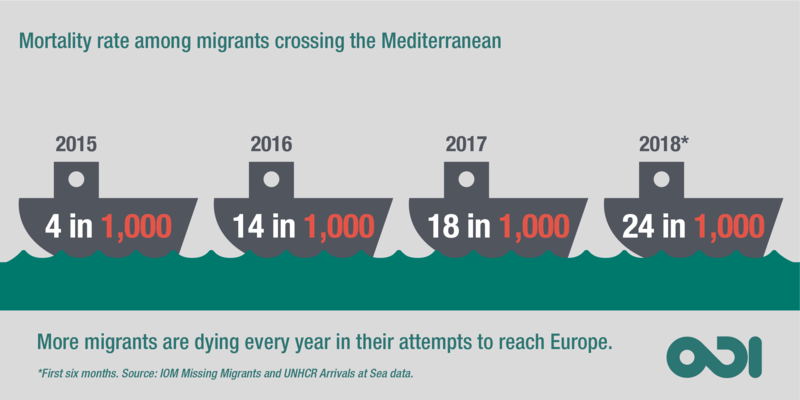 The estimated death rate on boat migration journeys across the Mediterranean has risen from 4 per 1000 in 2015 to 24 per 1000 in the first four months of 2018, according to available data. While the death rate is higher than ever, the size of migration flows across the Mediterranean has shrunk dramatically. The number of refugees and other migrants who crossed the Mediterranean in June was down 94% compared to the peak of the migration and refugee crisis in 2015. This means that migration policy-makers now have an opportunity to move on from crisis response to a search for long-term solutions. Yet, Mediterranean boat migration is an increasingly thorny issue for intra-European relations, and a new surge in arrivals remains imaginable. It still dominates the political discourses of all major European countries. In Germany, Angela Merkel’s coalition remains wobbly due to disagreements over migration policy. Anxiety about migration is therefore much higher than the current number of border-crossings would suggest, and continues to shape policy-making. This was evident in the fraught discussions in the lead-up to the agreement reached by the European Council on 29 June. In fact, the pressure to reach agreement and deliver action seems to have overshadowed concerns about the feasibility of the proposed schemes. What is the aim of European policy on Mediterranean migration? Europe’s strategic ambition is clear: reduce the number of people who embark on journeys across the Mediterranean by boat. The more European countries struggle to share responsibility for those who are rescued at sea and brought to Europe, the stronger the desire to dissuade migrants from getting on a boat in the first place. Moreover, stemming the departures is said to be the only way of reducing the death toll. The challenge, as the European Council put it, is to ‘eliminate the incentive to embark’ on journeys across the Mediterranean. And the new migration agreement proposes a solution: setting up ‘regional disembarkation platforms’ outside the European Union. The logic is that if people rescued at sea are sent back to the coast they left, nobody will take the risk and pay the cost of getting on smugglers’ boats. Addressing the challenges of irregular migration is truly difficult. Still, it is baffling how the proposal for regional disembarkation platforms is embroiled in contradictions. The agreement itself is scant on specifics, but the challenges will surface as the policy makers have to make key decisions about how these platforms would work. First, will they be entry points for seeking asylum in Europe? The agreement suggests that the platforms might play this role. But if the platforms are entry points to the European asylum procedure, they will attract thousands of refugees who currently have no other option to apply for asylum in Europe than paying smugglers to set out to sea. This scenario raises a second question: what will be the possible ways of accessing the platforms? If they are reserved for refugees who have paid smugglers and are rescued at sea, access to protection will be just as reliant on smugglers as it is today. But if anyone can come knocking on the gate to the platforms, without having to be rescued first, the asylum caseload would swell. Such an outcome would be unacceptable to EU member states. As a recent EC note remarked, ‘to allow individuals to “apply” for asylum outside the EU […] is currently neither possible nor desirable. How does this relate to broader EU policies on migration? In some way, regional disembarkation platforms are a logical next step along the course the EU has been pursuing for years now. To stop refugees and other migrants from reaching its shores, the EU has been using a multi-pronged approach. On the one hand, the bloc has increased the use of aid to tackle the ‘root causes’ of migration – the logic being that if potential migrants are given other opportunities (e.g. skills training), they will be deterred from leaving. Similarly, information campaigns targeting aspiring migrants seek to deter people from setting out on dangerous journeys. Another major focus has been that of externalisation of border management – basically shifting border management to countries outside the EU: a key component of the EU-Turkey Deal is Turkey agreeing to take back refugees who crossed into Greece. Externalisation serves two purposes: keeping migrants physically out of Europe, but also as a deterrence measure sending potential migrants the implicit message that it won’t be easy to come to Europe. Regional disembarkation platforms are part of this process of externalisation. But there are key differences that make this proposal more extreme than policies pursued so far. Other externalization measures have aimed at preventing potential asylum seekers from reaching the point where they become eligible to launch a claim in Europe. The platforms will apparently serve a different role, by enabling the physical return of asylum seekers who have become Europe’s responsibility after being rescued by European ships in international waters. What do we know about efforts to deter irregular migration? The dim outlook for regional disembarkation platforms reflects more general limitations of deterrence measures in migration policy. Using decades worth of data, Michael Clemens and colleagues have shown that along the US-Mexico border greater deterrence and enforcement efforts have only reduced irregular migration when accompanied by greater legal migration pathways. Research by ODI has shown that information about deterrence measures and anti-migration messages rarely featured in migrant decision-making process. We will explore this further in our upcoming MIGNEX research project, which includes large-scale analyses of the drivers of migration in ten countries of origin and transit. The European Council presents regional disembarkation platforms as a strategy for ‘preventing tragic loss of life’. The irony of this argument is that these platforms will only deter sea crossings if they are dead ends where people who are rescued at sea are barred from seeking asylum in Europe. It is difficult to see how such a setup would be legally feasible, or indeed, ‘in line with our principles and values’, as the Council states. If the legal obstacles were overcome, there may indeed be fewer deaths at sea. But some of the deaths would simply occur out of sight instead. Refugees flee danger. Blocking access to seeking asylum puts more lives at risk and cannot be justified as a measure to save lives at sea. For now, the European Council glosses over the dilemmas that the regional disembarkation platforms will create. Facing the realities of the situation would not make perfect solutions appear, but it would enable an open debate in search of a defensible and effective migration policy. Jørgen Carling is Research Professor at PRIO. Jessica Hagen-Zanker is Senior Research Fellow at ODI. They are on Twitter as @jorgencarling and @j_hagenzanker, respectively.